The dancing fountains show in front of Bellagio hotel on Las Vegas Strip is literally breathtaking. 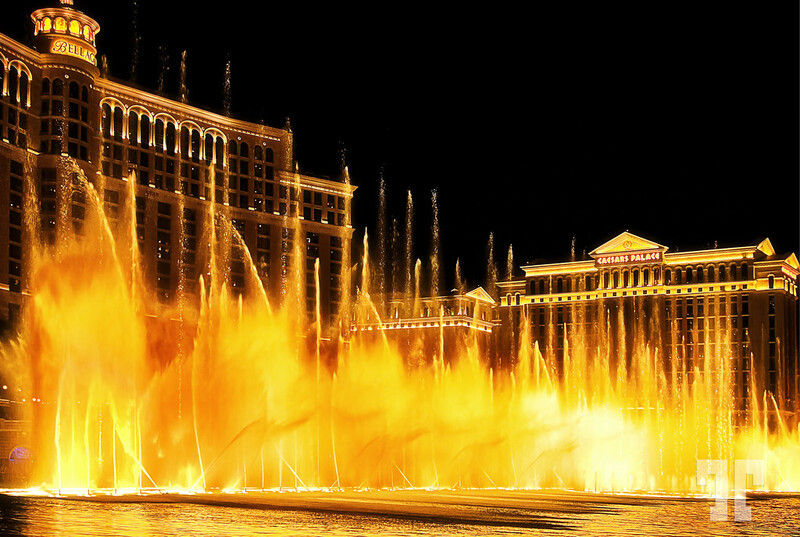 The exploding water from the Bellagio Lake looks exactly like a dance, synchronized to music. It’s a totally free show that you will not forget. The water show at Bellagio, on Las Vegas Strip is one of the most photographed attractions in Las Vegas. I never get bored watching them and that’s because they are always different. The water jets can go straight up and down with great force and speed, they can graciously converge in various angles or twist, interlacing with each other. The choreography, the lights and music change all the time – the only thing that stays the same is the WOW! One of my favorite activities in Las Vegas is walking on the strip and I always try to be around Bellagio at the right time for the water show:) One day I was walking on the other side and I just couldn’t resist to stop and take some photos from across the street. … and what about feeling like you are taking a bath right in the Bellagio fountains in the peace of your own bathroom? 🙂 Shower curtains with the view of the dancing waters in Las Vegas are also available in my collection. Click on the images to see options and prices. I was there once in the Paris imitation hotel across the street. Forget sleep when it starts. I thought gunfire or cannons were going off. It is pretty though.